I decided after I tried the polka-a-dot heart valentine glass and it turned out so well at least I thought so anyway, LOL I would try these also. I'm happier with one of them which is the second one I did but both look decent enough I guess, for me doing it. 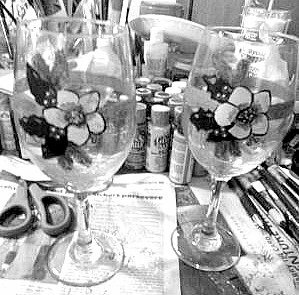 Thanks Cheryl for all you do and giving me the courage to finally try to paint on glass! Keep it up! You've inspired me to come up with a new design. Stay tuned!